International students who want to study engineering in the US will find that engineering is a growing field with great career prospects both in the U.S. and overseas. Students who have a strong interest in math and science should consider this path of study and the many different specializations that it offers. There are numerous engineering degree programs throughout the United States for international students to choose from. Engineering allows individuals to be creative while using science and math to design and operate a variety of different structures, machines, and processes. Engineering is becoming a widely popular area of study because of the job opportunities and compensation that it affords. It is a challenging yet rewarding subject that incorporates mathematics, sciences, and practical knowledge in order to design, build, and problem solve. Why Study Engineering in the US? Students who major in engineering will find that they have a wide variety of career options open to them following graduation. Luckily, engineering students also tend to have high levels of job satisfaction. In engineering careers there is a guarantee of change and evolution, which means that engineering students never have to worry about doing the same thing year after year. Additionally, engineering careers are generally well-paid. In fact, the starting salaries are among the best across all industry sectors. Engineering graduates will likely earn salaries higher than those in sales, human resources, and even finance. A degree in engineering also equips graduates with a number of transferable skills. Engineering students build skill sets that can be applied on a daily basis, such as problem solving, decision making, innovation, project management, teamwork skills, and communication. For this reason, engineering students tend to succeed in whatever field they choose. Entrance requirements for engineering programs vary college by college, but there are some commonalities. Most schools require that students take high level math and science courses as part of their general education requirements. In addition, many universities either require or offer a range of classes that allow potential engineering students to explore the different specializations within the field. Some colleges even require that students pass proficiency tests in math and physics before entering their programs, since these skills are essential to becoming a successful engineer. For international students who want to study engineering in the U.S., they should do their research and check out their school's website to review entrance requirements and degrees available. While most universities offer engineering programs, departments typically offer specializations within the field. If you are an international student considering a career in engineering, be sure to speak with students and faculty to determine the strengths and weaknesses of each program you are considering. Some of the common types of engineering offered include industrial, mechanical, electrical, chemical, and civil. As engineering grows in popularity, more specific areas of specialization are being offered including nuclear engineering, architectural engineering, and audio engineering. Although there are many engineering programs throughout the US, a few stand out among the rest. According to the U.S. News rankings, the Massachusetts Institute of Technology (MIT), Stanford University, and University of California—Berkeley top the charts when it comes to undergraduate engineering programs. International students who want to study engineering in the US and want a top tier education should consider applying to these programs. There are also many other programs that offer high quality engineering degrees that should not be discounted as they may offer a specialization and other unique qualities on campus. University of Kansas, for example, offers programs in Electrical and Electronics Engineering, Engineering Physics/Applied Physics, Engineering Science, and Engineering/Industrial Management. Additionally, Auburn University’s engineering program is constantly finding innovative ways to contribute to scientific development. Recently, the Auburn engineering team has joined its medical team in an effort to develop a polymer that is optimal for 3d printing of tissue and bones. The Auburn Engineering team is also conscious of the need for environmental conservation. Researchers have begun construction of a mobile mitochondria laboratory intended to analyze the effects of oil spills and other natural disasters at the field sites themselves. The lab will measure the mitochondrial energy production of vertebrates inhabiting the sites. In addition, researchers are working towards building the Alabama CO2 Utilization and Storage Center, which will find ways to capture CO2 emissions and convert them into green fuels. 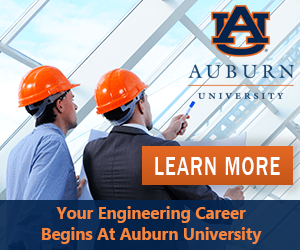 Auburn is on the front line of the Alabama conservation effort, and their engineering team contributes to this greatly. We recommend doing your research and deciding what factors are most important to your educational experience. If you are considering a degree in engineering, you will soon find that there are many career opportunities for students who graduate with an engineering degree under their belt. Whether you study chemical, mechanical, civil, or electrical engineering, there is a high demand for these new gained skills. According to the Bureau of Labor Statistics for the United States Department of Labor, engineering positions are some of the highest paid in the United States, and only require a bachelor's degree for an entry level position. Median salary was between $50,000 USD and $100,000 USD depending on area of specialization. The international job market for engineering is also promising, and emerging markets boast a high demand for engineers due to the major industrial and commercial expansion that they are undergoing. Regardless of what country you want to work in, you will need a good grasp on the language, and be able to use the technical terms necessary for engineers. Both career opportunities and salary can increase dramatically if students continue their education and pursue a graduate degree in engineering. Engineering is a difficult path of study, and international students should be prepared to put in long hours studying and working on projects. Although it is more challenging than many other degree programs, studying engineering in the US can open up the door to many lucrative and rewarding career opportunities. If you enjoy problem solving, math, science, and more, studying engineering may be right up your alley. Visit the Study in the USA School search to find schools that offer programs of study in Engineering. Over time we will be updating this section and including more information for those who want to study engineering in the USA and for other countries, but please feel free to post your thoughts and comments on our Facebook fan page, and also follow us and post questions through Twitter.